The best cat feeding schedule should meet both yours and your cat's preference. It's OK to choose either "set mealtimes" each day for your cat or to leave your cat's (dry) food out all day to allow her to graze. But sometimes, your cat's personality might dictate whether you can leave food out or not. If you choose to have set mealtimes for your cat feeding schedule, your adult cat should have two cat food meals per day, morning and evening. Canned cat food seems to be more practical for "mealtime cats" than for grazers. You can also leave out some dry cat food for your cat to snack on during the day, but be careful if he or she tends to overeat. Kittens under six months old should be fed three to five small kitten food meals throughout the day, or follow the manufacturer's recommendation. Dry cat food seems to work best for grazers (i.e., cats who like to eat throughout the day). This is obviously a more flexible cat feeding schedule for you and your cat and if it works for your cat, it can work better for folks who are gone most of the day. Be sure to give your cat fresh dry food every day. Don't just add more food to what's left over from the day before. It's also tempting to clean the food bowl a bit less often when you use dry food (or is that only me? ), but do your cat a favor and wash her food bowl frequently with hot water and soap. This will help keep your cat's food fresh and avoid ants or other pests. If your grazing cat starts to put on undesired weight, try to gradually switch his cat feeding schedule to a set mealtime schedule, or if that doesn't work for you and your schedule, you can switch to a lighter cat food or one specifically for less active cats. You can also make a point of measuring out the dry food you give your cat on a daily basis, and make sure not to give her too much. Consult your veterinarian about the right quantity of food for your cat, especially if your cat has special needs. You can also calculate the amount of food your healthy cat needs by following label guidelines. Please note that some sources disagree about whether leaving dry food out for your cat to graze on is a good idea. They believe the two-meal-a-day routine is more natural for your cat, as this is closer to the way cats in the wild live. They say that having only two meals a day allows your cat to fully digest her food, then her blood supply is free to concentrate on other organs. If you have any concerns, consult with your veterinarian about what's best for your particular cat. Some cats like to drink out of people glasses! 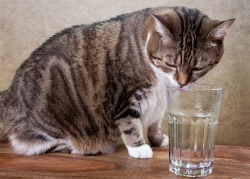 You should always have clean, fresh water available for your cat. Be sure to change your cat's water at least once per day. You could also use a pet fountain for your kitty if he or she prefers to drink running water. 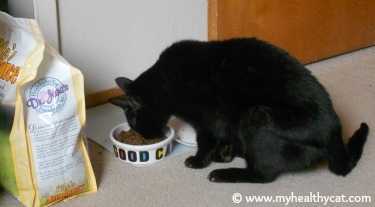 Choosing the Best Cat Food - How to find the right cat food to keep your cat healthy. Life's Abundance is my #1 recommendation for the best cat food online (or anywhere!). This is what we feed our two healthy kitties. They love the taste and we feel confident that they are getting the best possible feline nutrition. Try a sample so you can make sure your cat or kitten likes the taste. Only Natural Pet Store is my #2 recommendation for buying pet food online. They carry only natural products using top ingredients. The pet foods they carry are made from "human grade" products and exceed all AAFCO standards.